Come join us for a fun 3 hours of painting and learning! 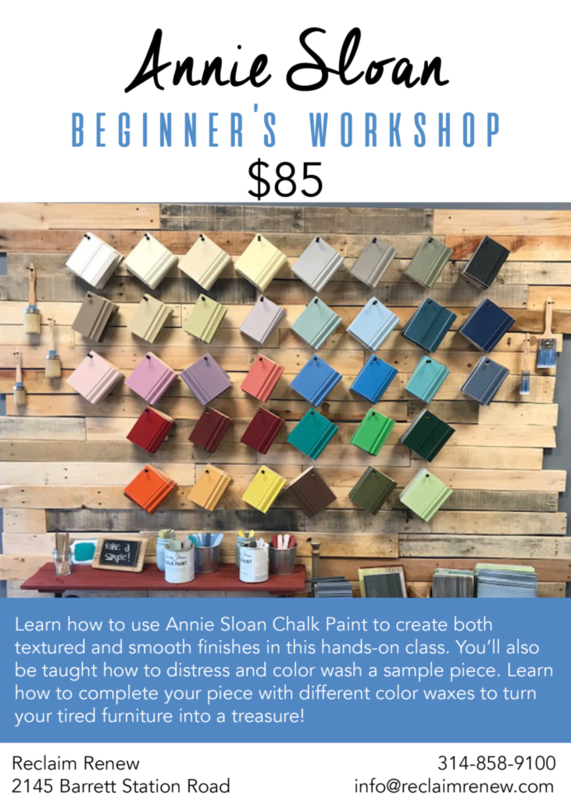 In this workshop you will learn how to use Annie Sloan Chalk Paint to create both a textured and smooth finish. We will also show you how to distress and color wash. You will learn how to use Annie Sloan Clear, Dark, Black and White Wax to finish your piece. This is a great opportunity to try out different colors to see what will work best to turn your old tired furniture into a treasure! Our class is hands on. Paint, wax, brushes, aprons and sample boards are provided. Refreshments will be available. Call us today or pay online to reserve your spot! 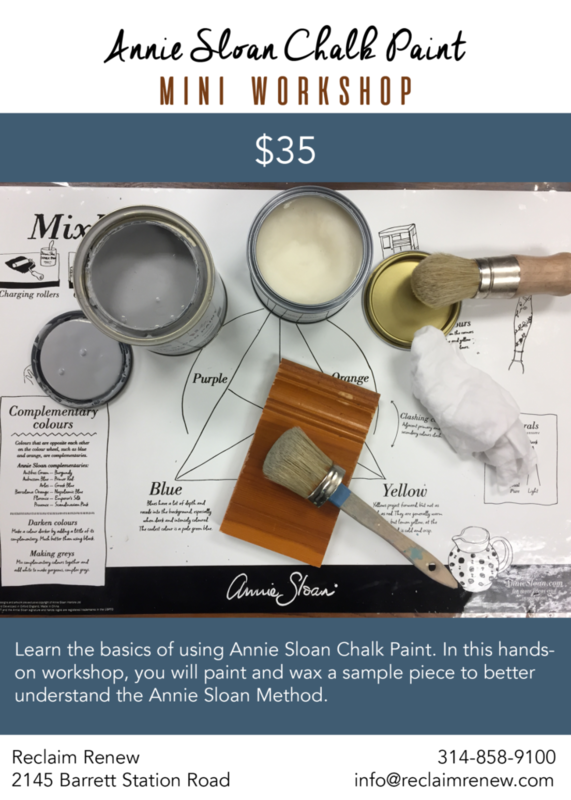 Now that you have used and fallen in love with Annie Sloan Chalk Paint, join Reclaim Renew for our Intermediate Workshop. 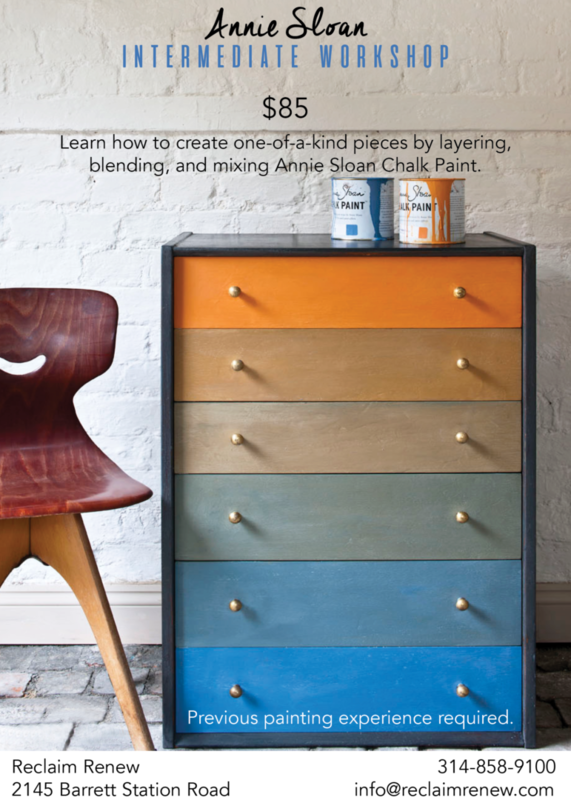 You will learn how Annie’s color wheel works and how to mix Annie Sloan Chalk Paint to create gorgeous custom colors. You will also color wash and dry brush multiple colors to create a beautiful layered look that has texture and depth. Top off your piece with Clear and Colored Wax for a complete look. Our class is hands on. Paint, wax, brushes, aprons and sample boards are provided. Refreshments will be available. Check back later for date. Payment required for reservation. Cancellation must be 10 days prior to the start of class for full refund.